Some are made live at a recording piano which scrapes a rolling carbon-copy wheel to make scratches that will later be transferred to punches in production. But another machine lets a technician play through the piece at whatever tempo he (in this case) desires, and has hold levers that leave some notes sustained. It’s a marvel of turn-of-the-last-century engineering. And of course, rolls could be cut by hand with a hole punch. But technology has not left the paper piano roll alone. 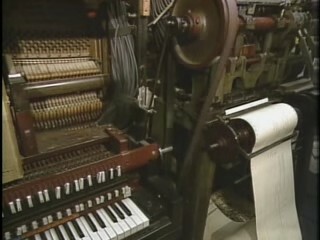 In the mid-80s, the QRS company had computer piano-roll-editor software up and running on its Apple ][s. Indeed, their production setup seems to be sixteen simultaneous punches driven by one Apple. Modern four-axis CNC machines, eat your heart out. If you like music, or old computers, or both, this video is a gem. Of course, we’ve seen our share of hacks that read piano rolls — here and here and even here — the physical machines, with their pulleys and wheels and wheezy pneumatic systems, are still (retro-)cool enough in their own right. Nice video, sad to think most of that machinery has probably been scrapped. The sort of thing that should be in a museum, at least we have a video though so that people can see how it worked. Probably not. QRS is still around; their latest thing appears to be an Internet of Player Pianos. Well, according to How It’s Made Season 13, Episode 3 they still had it up and running 2009-ish at least. But they compose on modern computers, with MIDI keyboards and everything, then put it on the Apple II. The show this item is from, the TV Ontario’s “The Acme School of Stuff”, was one of the best. I think it as a kid started my son on the road to becoming an engineer. Piano Rolls were a big part of the 1909 Copyright Act. QRS still comes out with new ones but most of there music is dated. I wish there was a place to get some rage against the machine rolls. Knoebels, an amusement park in Elysburg, Pennsylvania has several band organs located around the park. These organs are still ran off of the piano roles, and add to the fun (and noise) of the park. Why weren’t all the piano rolls converted to midi files and put on the Internet? The pianos might not exist anymore but the music can live on. The pianos still exist and many rolls have been played and released on CD. Interesting. Looking at the rolls, they’re only punching round holes. When a not is held for a long time, thye just punch the round holes closer together and let the mechanical lag of the piano act to hold the not. When I was younger, I had a friend who had a player piano. Her rolls had long oval holes where the note was held. Thinking about how those must have been cut — they would have had to use a roller or something like that to cut a long oval hole. Short notes were round holes, like the QRS machine makes. So, I wonder…were the oval holes originally a series of round holes, spaced closely together and then cut to oval shape in a post-process? The sides were absolutely straight, so they weren’t cut by using overlapping round holes. Not necessarily “mechanical lag”, really; it’s pneumatic. You need more air initially (hence the 2 or 3 closely-spaced holes at the beginning of a long note), but once the valve is actuated, you only need enough air to keep up with a small bleed orifice, so more space between holes is okay. The Roman numbers one to five. I,II,III,IV,V. Please stop this bassakwards brackets! The punch strikes when the paper isn’t moving, then the paper moves a small amount. Repeat. The live punch was very loud, think dot matrix printer including the stuttering motion of the roll. Chain holes (long notes) cause the roll of paper to rip if not handled well, so little webs are left in newer rolls which the player doesn’t respond to. Chads can mess up an election and clog a note on a player. One needs to vacuum the tracker bar once in a while. Many pianists made digital recordings then made a phono record and the engineer looked over your music and told you not to use the pedal and not to play pp or ppp and not to play ff or fff. Compression argh. The roll played everything from ppp to fff and “better than” they could. They lamented why this didn’t happen 100 to 150 years earlier, we’d have digital recordings of Beethoven and Mozart. There is a wide reaching program of rollscanning to preserve this legacy. The paper is the first gen of acid process and it’s life is up. There is little in the Smithsonion or elsewhere. QRS gave all of their 4X speed master rolls to the war effort right after P.H. Karoke was invented in 1906 when a minor roll maker printed the words to songs right on the roll. > The Roman numbers one to five. I,II,III,IV,V. Please stop this bassakwards brackets! If we do that, pedants crawl out of the woodwork telling us we’re screwing up the Apple ][, Apple II, and Apple // trademark. The //c used slashes, btw. There are two types of player pianos (at least): simple ones play a not that is either on or off. (these are often the ones you hear in movies, etc.) More complex ones reproduce the exact travel of the keys and sound almost exactly like a live performance. Thanks to the more complex type, we can hear the playing style of performers who predate other recording methods. The difference between Metronomic, Hand played, and Reproducing rolls is all on the manufacturing side – all player pianos can run any of them. I think you underestimated the power of APPLE ][ technology, 16 holes are being punched per roll, but 4 rolls are being punched by the ][ simultaneously, so that’s whew 64 outputs at a time! In the end though, it’s still not a high bandwidth, 64 outputs is just 8 bytes and you can see from the video the Apple ][ when punching from disk punches rows 5103 to 5131 in 2.8s, i.e. about 10 rows/s. That’s just 80 bytes per second, very easy for an early 1MHz 8-bitter, in Forth or Machine code. The really interesting thing is that it’s punching from disk. However, the Apple ][ didn’t have any automatic disk transfer, instead all the IO was byte-bashed with interrupts off. So, how did they manage to keep the punches working during disk access? I want to know why they call it a “word roll”. Does that mean it has lyrics printed on it? Some of them did indeed have the song’s lyrics printed on them so one could sing along, karaoke-style. There is still one player and recorder piano in the world. It is in DC. Oddly enough it was used to record the music of Gershwin, and one other,…..
As a child my parents took me to Buffalo, NY to tour the QRS factory. Was really something to see the whole production. Since we had similar Apple II+’s in school I was immediately drawn to this machine. Rudy (QRS chief engineer) popped the cover off and showed me the custom interface cards for the cutting rack. Mom probably still has photos of the intricacies of this device — albeit on 35mm negatives. Neat! Consider scanning them. Modern scanners can invert negatives and enlarge. But get this…that Apple II is still there humming along, orchestrating the movements of that hulking electropneumatic wonder (Or, at least it was in 2009-ish when the episode was filmed) presumably because nobody knows where to even *start* when it comes to replacing that crazy Willy Wonka plumbing or the– what I can only imagine is –exquisitely complex custom interface board, with modern hardware.